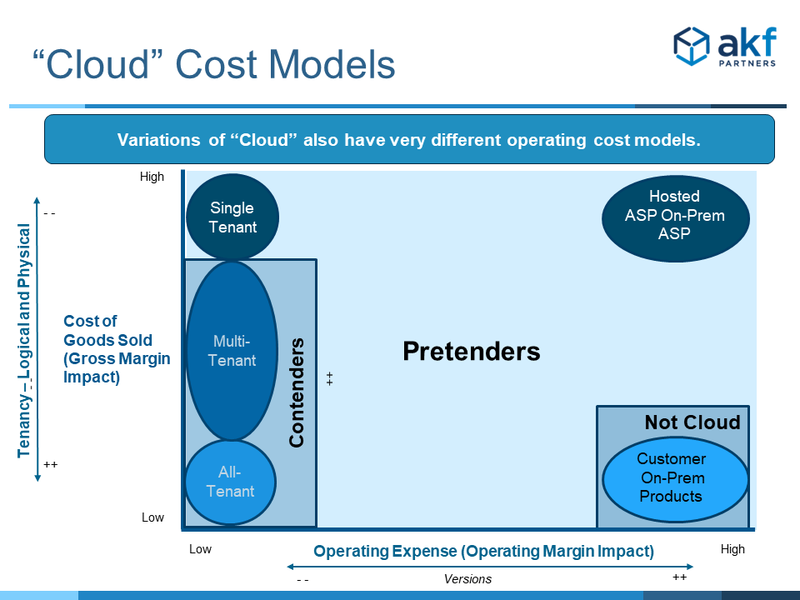 Of the many SaaS operating principles, perhaps one of the most misunderstood is the principle of tenancy. Most people have a definition in their mind for the term “multi-tenant”. Unfortunately, because the term has so many valid interpretations its usage can sometimes be confusing. Does multi-tenant refer to the physical or logical implementation of our product? 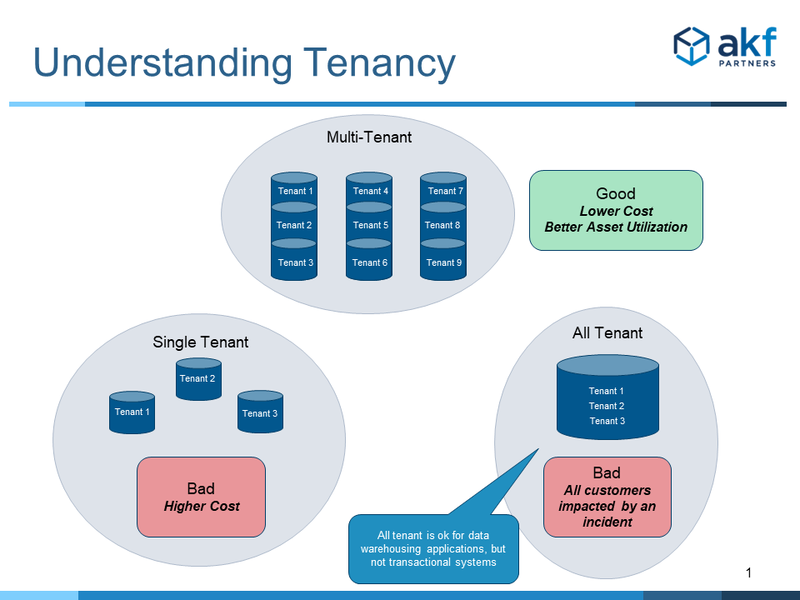 What does multi-tenant mean when it comes to an implementation in a database? This article first covers the goals of increasing tenancy within solutions, then delves into the various meanings of tenancy. Interestingly, multitenant solutions often “force” another SaaS principle to be true: No more than 1 to 3 versions of software for the entire customer base. This is especially true if the database is shared at a logical (row-level) basis (more on that later). Lowering the number of versions of the product, decreases the operating expense necessary to maintain multiple versions and therefore also increases operating margins. An important point to keep in mind is that “tenancy” occurs along a spectrum moving from single-tenant to all-tenant. 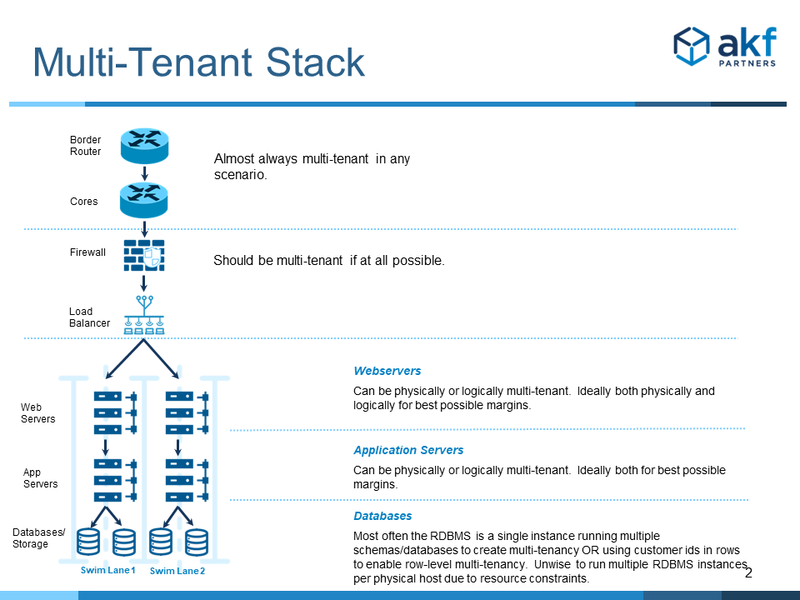 Multitenant is any solution where the number of tenants from a physical or logical perspective is greater than one, including all-tenant implementations. As tenancy increases, so does Cost of Goods Sold (COGS from the above figure) decrease and Gross Margins increase. The problem with All-Tenant solutions, while attractive from a cost perspective, is that they create a single failure domain [insert https://akfpartners.com/growth-blog/fault-isolation], thereby decreasing overall availability. When something goes poorly with our product, everything is off line. For that reason, we differentiate between solutions that enable multi-tenancy for cost reasons and all-tenant solutions. Multitenant solutions can be implemented in many ways and at many tiers. Physical multi-tenancy is having multiple customers share a number of servers. This helps increase the overall utilization of these servers and therefore reduce costs of goods sold. Customers need not share the application for a solution to be physically multitenant. One could, for instance, run a webserver, application server or database per customer. Many customers with concerns over data separation and privacy are fine with physical multitenancy as long as their data is logically separated. Logical multi-tenancy is having data share the same application. The same webserver instances, application server instances and database is used for any customer. The situation becomes a bit murkier however when it comes to databases. Different relational databases use different terms for similar implementations. A SQLServer database, for instance, looks very much like an Oracle Schema. Within databases, a solution can be logically multitenant by either implementing tenancy in a table (we call that row level multitenancy) or within a schema/database (we call that schema multitenancy). In either case, a single instance of the relational database management system or software (RDBMS) is used, while customer transactions are separated by a customer id inside a table, or by database/schema id if separated as such. While physical multitenancy provides cost benefits, logical multitenancy often provides significantly greater cost benefits. Because applications are shared, we need less system overhead to run an application for each customer and thusly can get even greater throughput and efficiencies out of our physical or virtualized servers. The diagram below helps to illustrate that every layer in our service architecture has an impact to multi-tenancy. We can be physically or logically multi-tenant at the network layer, the web server layer, the application layer and the persistence or database layer. The deeper into the stack our tenancy goes, the greater the beneficial impact (cost savings) to costs of goods sold and the higher our gross margins. 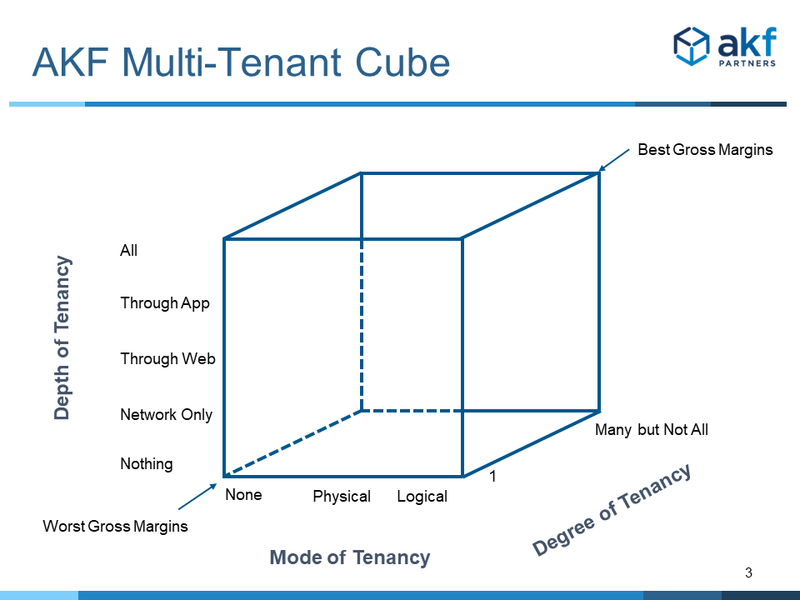 To further the understanding of tenancy, we introduce the AKF Multi-Tenant Cube. The X axis describes the “mode’ of tenancy, moving from shared nothing, to physical, to logical. As we progress from sharing nothing to sharing everything, utilization goes up and cost of goods sold goes down. The Y axis describes the depth of tenancy from shared nothing, through network, web, app and finally persistence or database tier. Again, as the depth of tenancy increase, so do Gross Margins. The Z axis describes the degree of tenancy, or the number of tenants. Higher levels of tenancy decrease costs of goods sold, but architecturally we never want a failure domain that encompasses all tenants. When running a XaaS (SaaS, etc) business, we are best off implementing logical multitenancy through every layer of our architecture. While we want tenancy to be high per instance, we also do not want all tenants to be in a single implementation. AKF Partners helps companies of all sizes achieve their availability, time to market, scalability, cost and business goals.